The other day a brand new BMW 435i came through the Mod Auto Shop to be fitted with a new set of shoes at our installation facility. A set of 19 inch Forgestar F14 wheels for BMW with a conservative fitment gives the car a great muscular aesthetic. Up front the car wears 235/35-19 Hankook Ventus V12 Evo tires and the rears are wrapped in 275/30-19s around the 19 Inch Forgestar F14 wheels. The 4-series is a departure from the E92/E93 3-Series Coupes but manages to crank up the aggression level in its design, with gaping brake cooling ducts in the bumper fascia and fenders. The fitment for Forgestar F14 Wheels for F32 BMW 4-Series is different than the E9x platform and calls for different offsets. We’re really excited to see what enthusiasts do with the new BMW 4-series platform. If you’re looking for BMW 4-series wheels, you can get yours at ModBargains. 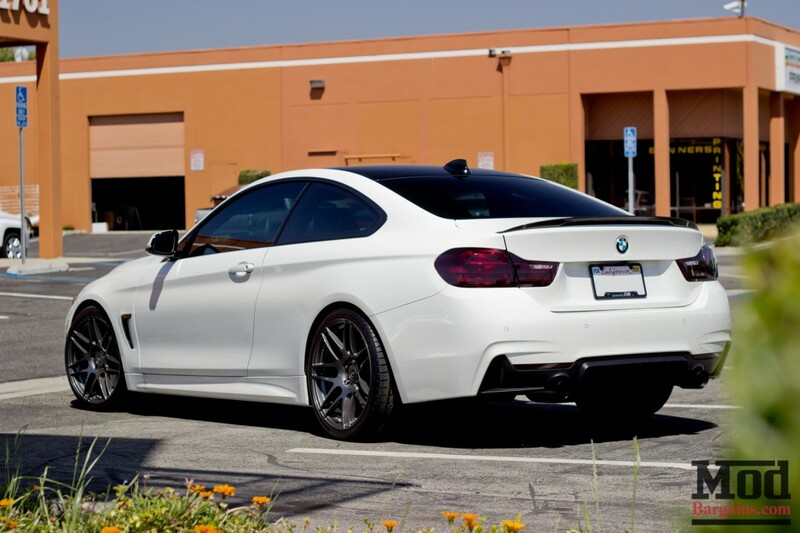 Call 714-582-3330 or visit www.modbargains.com/bmw-wheels.htm to browse our huge selection of BMW specific wheels. Not sure what fitment or offset you need to go wide without rubbing? Our Modification Experts can recommend a fitment for you. Chat online or call today!